The Buckeyes are in Miami for the Orange Bowl, a matchup against Tahj Boyd and the Clemson Tigers! Coverage is scheduled to start at 8PM – make sure to stop by and enjoy the last Football Liveblog of the season! Go Bucks! Notable in his absence from Orange Bowl prep this week, the reports were that Noah Spence had violated a team rule and was working his way back into the good graces of the team with hopes that he would rejoin the Buckeyes in time to face Clemson. Today, however, those hopes were dissolved, as it was announced that the sophomore from Pennsylvania has been suspended for three games for violations of conference rules, beginning with this week’s game in Miami. While the specifics of the infractions are not yet know, it’s speculated that it may not have been one thing but instead a combination of concerns. In the statement from the University, printed below, special attention is made to Spence’s being Academic All-Conference, raising speculation that the issues may be classroom related. It has been determined that Ohio State University sophomore Noah Spence has violated a Big Ten Conference rule and he has been suspended for three games, starting with the Discover Orange Bowl this Friday. Spence’s parents, who did not agree with the rule violation nor the penalty imposed, were assisted by the Ohio State Department of Athletics in exhausting the appeals process that was available to them with the Big Ten. 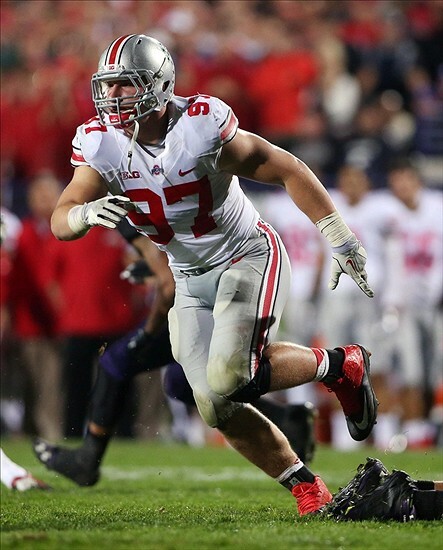 Spence is an Academic All-Big Ten honoree and an OSU Scholar-Athlete. He will continue course work toward his sociology degree next semester and he will be able to practice with the team this spring, but he will not be eligible to play in a game until Ohio State’s third game of the 2014 season, Sept. 13 vs. Kent State. The Department of Athletics will have no further comment on this issue. From the tone of that, it certainly sounds like it’s not just Noah’s parents who are frustrated, but that the University is disappointed with the result of the appeal as well. Due to numerous factors, we may never know the full extent of the situation. However, we’ll keep you up to date as information becomes available. *UPDATE- There’s a lot of speculation that this issue was one with an improper dietary supplement, and was detected during the B1G Championship’s mandatory screening. *UPDATE 2- Not totally related, but it appears that Ohio State will also be without Bradley Roby for the game as well. Curtis Grant is medically cleared and will play. Amidst all of the revelry from last night (hoops win, amazing bowl game, good news from All American practices, traditional end of year festivities), we asked the staff to come up with some resolutions that members of the Ohio State football and basketball programs should adapt for 2014. Just for giggles, we’ve added a “wild card” where people could either make another “suggestion” or publicly announce one of their own. I, Curtis Grant, do hereby resolve to live up to the reputation that preceded my arrival at THE Ohio State University. I will step into the limelight and make sure people don’t miss Ryan Shazier next season. “I, Luke Fickell, do hereby resolve to spend the off-season getting my head out of my tuchas and learning how to coach defense”. “I, Braxton Miller, do hereby resolve to spend the off-season learning how to actually ‘read’ the zone-read play for 2014″.